On Friday, we hosted our 2nd Annual Picnic in the Park with Bravas. 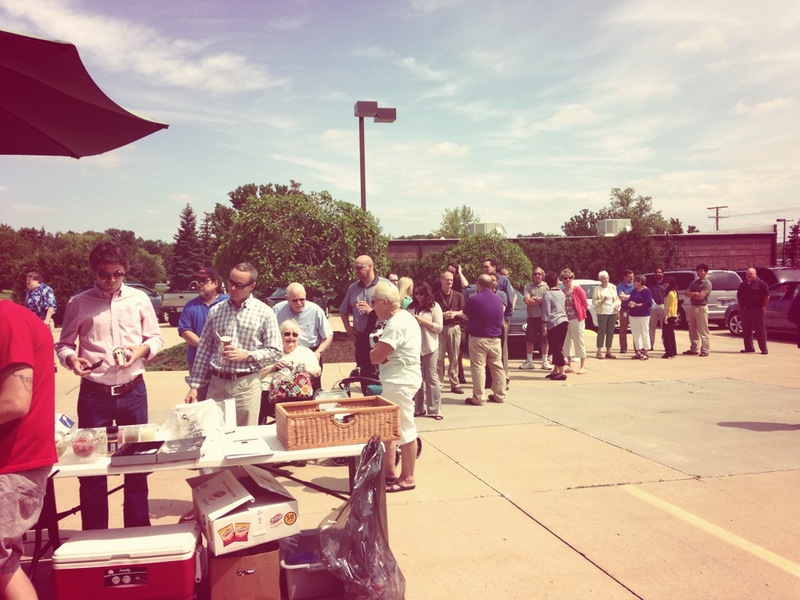 Attendees enjoyed hot dogs, Edy’s ice cream, beverages and games. Just like last year, a portion of the proceeds from hot dog sales were donated to our organization. Thanks to Bo with Bravas and to everyone who came out to make the day a success. $400 was raised, which will cover the cost of care for one person for an entire year. Thank you! On June 18, the Cobblestone Ladies Golf Association will host the 17th Annual Swing for Cancer to benefit our organization at Cobblestone Golf Course in Kendallville. 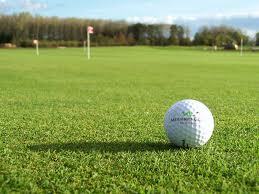 The event is a scramble and golfers need not be concerned about ability. The registration deadline is June 8 and forms are available at our office or by calling Phyllis Weber at (260) 347-1674. Our friends at Fire Police City County Federal Credit Union dropped by last week with a check for over $1,300, which was raised through their Lapper team and cancer tee-shirt sales. We are so grateful for their support! On May 10, country singer Bekah Bradley hosted an album release party at Sweetwater Sound and donated a portion of the proceeds from the sale of her album to our organization. She raised over $500 for us! Thank you Bekah. We are honored that you chose us as the beneficiary of this event. We appreciate your support. 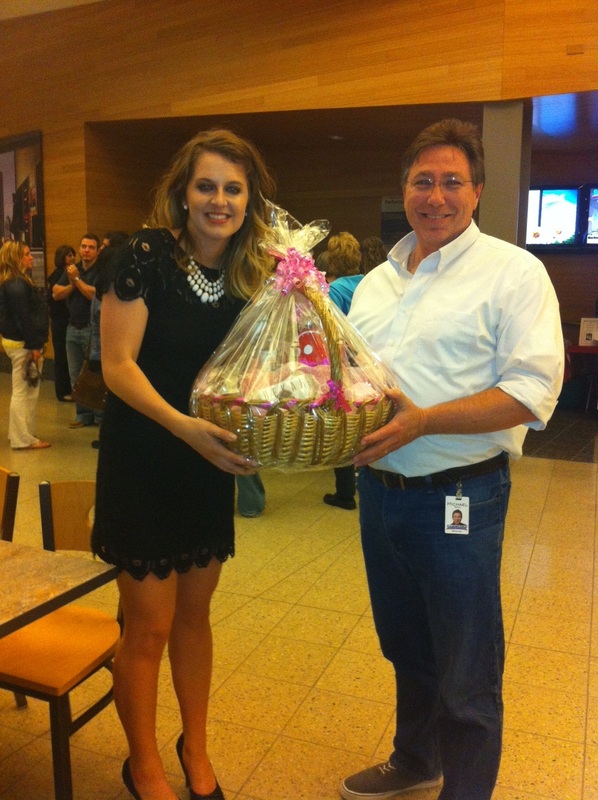 Bekah Bradley with the winner of the Breast Cancer gift basket. He donated the basket to us to be used at an upcoming event. 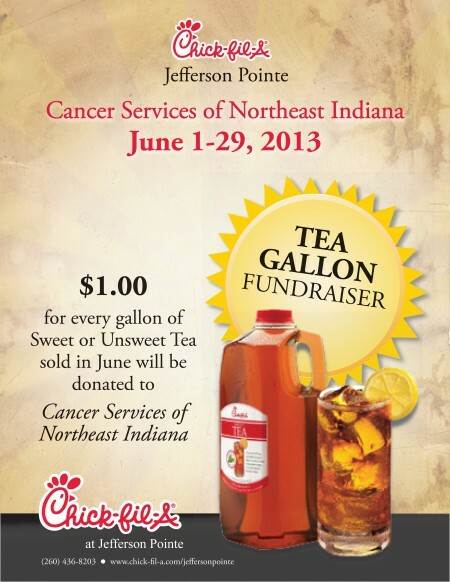 Our friends at Chick-fil-a at Jefferson Pointe are hosting a Tea Gallon Fundraiser to support our organization! Throughout June, $1 for every gallon of Sweet or Unsweet Tea sold will be donated to us! Thank you Chick-fil-a, and thanks to all who purchase tea in June! Join us on Friday, June 7, for our annual Picnic in the Park. 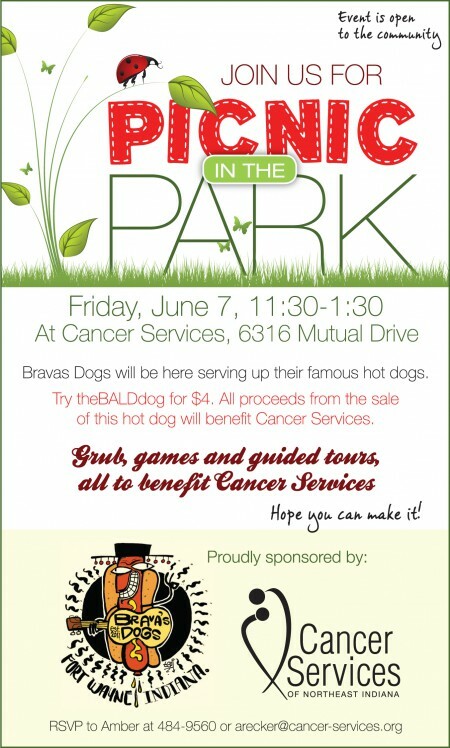 Our friends at Bravas Dogs will be here serving up their famous hot dogs. Make sure you try theBALDdog for $4. All proceeds from the sale of this dog benefit our organization! We will also have games on hand for folks to play, along with tour of our new Healing Garden. So come on out! We’d love to see you. Lapper & Survivors Day Success! On Saturday, over 500 people attended our 11th Annual Lapper & Survivors Day event to raise money for people with all types of cancer in our community. 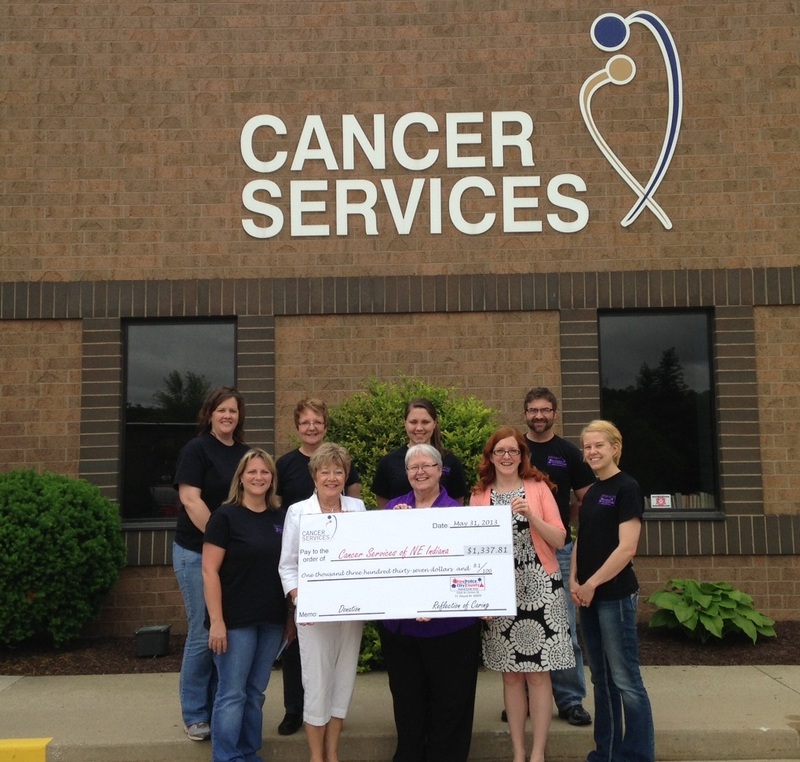 Over $55,000 was raised, which will support programs providing emotional support, practical resources, and information to over 3,000 people with cancer and their families each year. Thank you to all those who attended this year’s event. We enjoyed spending our morning with you! We could not do what we do without supporters like you. Couldn’t make it to the event, but still want to help? There’s still time! If you’d like to make a donation, visit our event page. We are proud to be a charity partner for this year’s Fort 4 Fitness, which takes place September 27-28 at Parkview Field. Being a partner means that for every runner or walker who registers as a member of our team for any of the races, Fort 4 Fitness will donate a portion of the registration fees to our organization. What a great way for you to get in shape AND help people with cancer in our community. Find out how you can sign up by visiting our Fort 4 Fitness page. If you’ve already registered and still want to be part of our team, please email Amber at arecker@cancer-services.org. 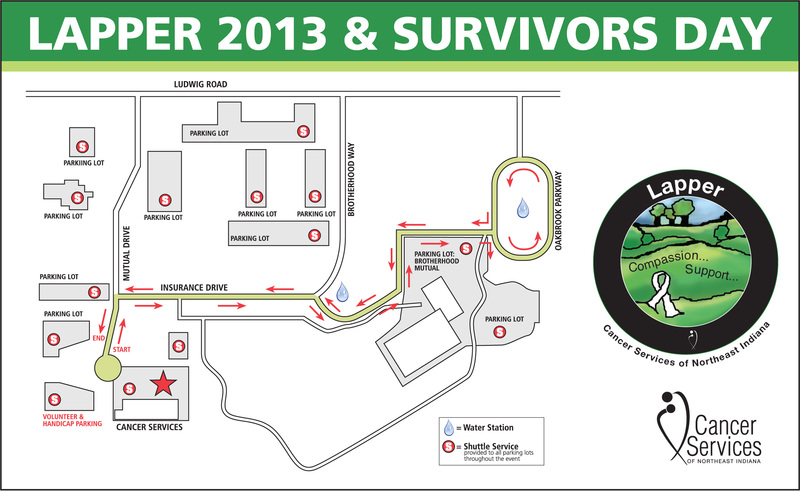 Our annual Lapper Walk and Survivors Day celebration is just days away! If you haven’t registered, don’t worry. You may still do so online, or you may register the morning of the event. Here’s this year’s route map. Although the Bust a Move event is a few months away (save the date for Friday, October 4), the project begins much earlier in the year with the casting sessions. Each year, we cast between 12-18 breast cancer survivors, creating plaster representations that artists transform into beautiful works of art. The process of casting is a moving experience for the survivors and the volunteers who help. For the survivors, it gives them a chance to talk about their experience and share in the celebration of the beauty of their bodies and their courage. For the volunteers, Bust a Move provides an opportunity to contribute to a meaningful project and hear the stories of survival first hand. Last weekend, we hosted this year’s casting sessions and met 18 courageous women willing to bear it all for the sake of raising money for much-needed services for breast cancer survivors. They understand the importance of a support system and the programs and services offered here. Over the next few months, you’ll get to meet the survivors, artists, and volunteers involved in this project. Stay tuned for future blog posts, and make sure you mark your calendar for this year’s event, which will once again be hosted at the Fort Wayne Museum of Art. We are proud to partner once again with the Fort Wayne Derby Girls, the founding sponsor, to bring you the 6th Annual Bust a Move.